A pedestrian walks past a sign for West Block 1928 Condos in Toronto on May 27, 2017. Investors who buy new condos in Toronto are finding it increasingly difficult to charge enough rent to cover their mortgage costs, and the situation is expected to worsen by 2021 as sale prices rise, according to a new study to be released Friday. The report, co-authored by CIBC World Markets Inc. economist Benjamin Tal and Urbanation Inc. senior vice-president Shaun Hildebrand, concluded investors accounted for almost half – at least 48 per cent – of all buyers who took possession of newly constructed condos in the Greater Toronto Area in 2017. At least 44 per cent of those investors with a mortgage are currently in a negative cash flow position, which means the rental rates they charge tenants are not enough to cover their mortgage payments and condo maintenance fees, the report said. Among those who are in a negative position, 34.5 per cent have a shortfall of more than $1,000 each month, while a further 20 per cent are short between $500 and $1,000 a month, it says. A shortfall means condo owners must fund mortgage costs or maintenance fees from their own cash sources. The data is significant because investors have become a huge force driving Toronto’s booming condo market, but rising purchase costs may curb investor demand. While condo rents climbed by 9 per cent last year, rising sale prices have still made it harder for owners to cover large mortgage payments when they make minimal down payments. 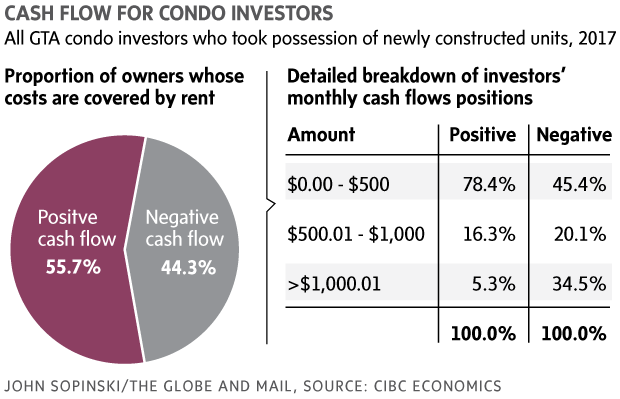 Mr. Tal said the “math is changing” for condo investors, but many of them are wealthy enough to absorb monthly losses, and do so because they anticipate the capital gains they will ultimately earn will far outstrip the expense. “They see it as paying a little bit a month for something that will appreciate dramatically,” Mr. Tal said in an interview. The report found 77 per cent of investors who took possession of a condo last year had a mortgage, with the average investor putting 20 per cent down on a condo purchase. That means the typical investor has a large mortgage to cover with rent payments. [Condo investors] see it as paying a little bit a month for something that will appreciate dramatically. — Bejamin Tal, deputy chief economist of CIBC World Markets Inc.
Those who took possession of new condos in 2017 have already earned “exceptional” returns based on the price at the time they signed the deal to buy the new units – an average of five years earlier – and the market value at the time they took possession. The average unit increased in value by 51 per cent over the five-year waiting period prior to delivery, and the typical investor who put just 20 per cent down – an average of $75,000 – earned a return of 155 per cent, or 30.9 per cent on an annualized basis. But the return may not be as strong for investors going forward if the market slows and rents do not climb quickly. The report said investors who bought pre-construction units in 2017 – after two years of large price gains in the condo sector – with a scheduled completion date in 2021 would need average rents to rise by 17 per cent in the next four years to cover their mortgage and maintenance fees if interest rates do not change, assuming a 20-per-cent down payment. If interest rates rise by one percentage point by 2021, however, rents would have to increase by 28 per cent by 2021 to cover mortgage and maintenance fees. If interest rates rise by two percentage points, rents would have to climb by 39 per cent, the report said. Mr. Hildebrand from Urbanation, believes a 28-per-cent rent increase is unlikely because there is a high level of new construction currently, which will create more rental supply. The report forecasts condo unit completions will average about 22,230 units a year between 2018 and 2021, a strong increase from a five-year low of 15,500 units completed in 2017. “That’s not to say that every unit will be under water in terms of cash flow, but the balance is probably going to tip to a a higher percentage in negative cash flow than positive cash flow,” Mr. Hildebrand said. Mr. Hildebrand said the data demonstrates that condo investing “is not a sure thing,” but he doesn’t foresee a condo market crash, even if many investors were to suddenly decide to sell rather than finance monthly losses. The risks seem to be pretty well contained at this point, but we do caution that the economics of investing is likely to become more challenging in the coming years. ... Achieving positive cash flow may be hard than in the past. — Shaun Hildebrand, senior vice-president of Urbanation Inc. The report estimates that even if all investors who took possession in 2017 and have negative cash flows over $500 a month decided to sell their units, the extra supply would add about 1,400 units to the market, representing 9 per cent of new-construction condo units completed last year or 3.4 per cent of resale condo units sold last year. “The risks seem to be pretty well contained at this point, but we do caution that the economics of investing is likely to become more challenging in the coming years. … Achieving positive cash flow may be harder than in the past,” Mr. Hildebrand said. Even if some investors sell, Mr. Tal said there is a lot of “pent-up” demand from buyers who could absorb some of the growing supply. Editor’s note: A story in Report on Business on Friday about condominium investing in Toronto quoted Urbanation Inc. senior vice-president Shaun Hildebrand saying he thinks it is unlikely that condo rental rates will increase by 17 per cent by 2021. In fact, Mr. Hildebrand said he thought it was unlikely rental rates would increase by 28 per cent by 2021.